Penned Without Ink: PENNED WITHOUT INK Celebrates its First Anniversary! PENNED WITHOUT INK Celebrates its First Anniversary! For most, September 26, 2016 seemed like a typical fall day - complete with falling leaves, pumpkins or mums arranged on front porch steps, and early morning school buses rolling by. For me, I awoke to a day long anticipated . . . the release date for Penned Without Ink: Trusting God to Write Your Story. I flew down the stairs first thing that morning and checked in with Amazon. Sure enough, there it was . . . a newborn book, ready to share with the world! Then, on November 5th, many of you joined me at Duffy's Coffee House in Northeast PA for my book signing. All these months later, I am still overcome with gratefulness for your prayers and support . . . and by the fact that you wanted to read our story. THANK YOU. Many have come back to thank me for writing about our journey and to express how much it has encouraged them. I shared my book at several churches, a college class, a ladies' luncheon, a book club, and even went to an elementary school as an "author." I taught a workshop at the Women's LYFE Conference. One of the most rewarding experiences took place last fall when a group of women gathered to study God's Word, using Penned as the text. What a privilege for me to lead a small group using my own book! Together, we all learned more about what it means to truly trust God with our life stories. 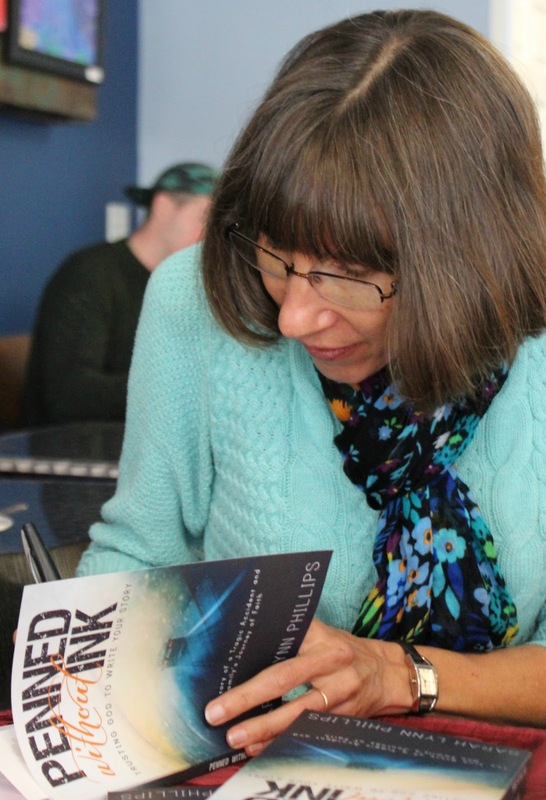 As I prayed about what to write next, a professor asked if she could use Penned with a reading group on her college campus in NC this semester. Her request gave me the direction I needed to organize and add to my notes from last fall to create a Penned Without Ink Guide for Small Group Leaders, which I completed in time to send to her last month. On this first anniversary of Penned Without Ink, I want to share my hope and prayer that this Guide for Small Group Leaders will be available in the near future. My goal is to equip facilitators with practical resources to help lead individuals/groups to increase their trust and hope in a faithful God who writes perfect stories. Presently, an editor is reviewing it. I'll keep you posted. Again, thank you for your support for me and for Penned Without Ink. If our story has blessed and encouraged you, I hope you'll share it. You can still find it on Amazon in both paperback and Kindle formats here. In all our endeavors, it's the people who make all the difference . . . people who have a story that's unique and important . . .